Are you interested in practicing golf at home? Does your golf club need to rejuvenate its greens? At Grass Solutions, we are proud to offer the latest in synthetic grass golf green solutions. PGS Supergreen … the future in golf greens! 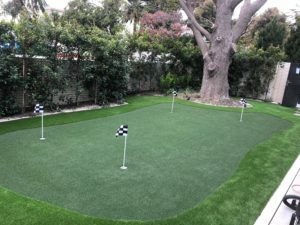 Grass Solutions offer a wide range of synthetic grass putting greens that are designed for the serious golfer who would like to maintain or increase their putting/chipping skills within the convenience of their own home. 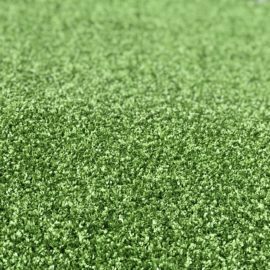 Our synthetic grass range can be installed on any hard surface including a crushed rock base, concrete or floor boards. Having a minimal sand infill, allows the system to be shaped to any design, building in sand bunkers, water hazards and other features (outdoor) to be incorporated in the overall design. Kingston Green 15mm – light green colour perfect for backyard installation to practice your golf skills at home. One of the key design features is the enhanced speed, ease of installation and the reduction of on-going maintenance. Royal Green 20 mm with ‘Heat Block Technology’. Royal Green – dark green in colour is 25% cooler than other synthetic grasses on a hot Summer’s day. Non-directional texturized artificial synthetic grass with realistic putting speed. PGS Supergreen Is the professionals choice for synthetic golf greens. It is a completely new generation golf product, allows you to do everything you are able to do on a natural grass green. Easy to contour and build in undulation and other design features. It is also a great solution for Golf Clubs looking to rejuvenate greens, during dry or heavy wet periods. A cost effective and environmentally friendly solution to water restrictions and maintenance costs. Pro Leisure 9 mm – ideal for mini golf applications. Applied directly to clean hard surface. Use Pro Lawn 35 mm a lighter green grass as the fringe! Use Pro Lawn Gold 37 mm a darker green longer pile grass as the rough/fringe of the application. Visit our Shop On Line to purchase green accessories including putting, cups flags and poles.